To Sum It Up: Los Angeles literally embodies its nickname, City of Angels. It is the capital of the Angel world, where Angels are idolized like celebrities, and humans who can afford it can pay for a Guardian Angel’s protection. Jackson Godspeed is about to become the youngest Angel ever to join the ranks of the Guardians. His face is all over the media, but Jackson’s fame and Angel-mania in general fail to impress Maddy Montgomery, even after meeting him in person. Whether she wants to or not, though, Maddy is about to find herself enmeshed in the Angels’ world, which at this moment is being rocked by a killer who is targeting them. Review: I don’t know what it is with angel books, but I seem to have no luck with them. Hush, Hush, Embrace, and Illuminate all fell flat for me. Sometimes I wonder if I’m just meant to stay away from books about angels and instead stick to reading about vampires, demons, and other unholy creatures. I’m determined to find some good YA angel reads, though, because I’m sure that they do exist; I just haven’t found them yet. 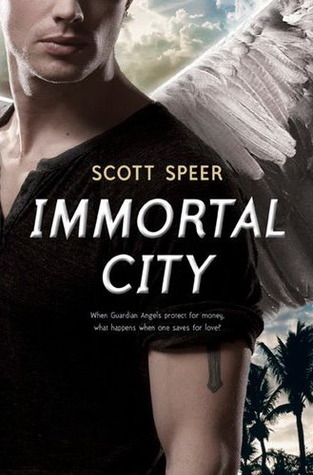 While not perfect, Immortal City was definitely a step-up from the other angel books that I’ve read. I really liked the concept of angels as celebrities; the “A” in “angel” is even capitalized in the book. Speer creates a glitzy, immersive world in which television networks like ANN (Angel News Network) bring viewers the latest Angel-related updates, and SaveTube features thrilling Guardian Angel rescues caught on camera. It’s very easy to buy into this vision of Los Angeles; the only real difference is that its most famous citizens happen to have wings. I found Maddy’s aloofness toward all of the Angel hype refreshing. Unlike her friend, Gwen, who lives and breathes everything Angel, Maddy can’t be bothered with any of it. Maddy is a pretty grounded heroine, but I wish that she’d been a little less generic. My main problem with both her and Jackson was that they seemed to be cut straight out of a YA character template with minimal customization. He’s a rich, ultra-famous superhuman being whose every move is scrutinized by the media, and she’s the humble mortal girl who can’t imagine ever catching the attention of someone like him. With such an original setting, I’d hoped that the two lead characters would be just as unique, but in the end, I thought that they were rather conventional. For me, the most intriguing part of this book was the mystery surrounding the murdered Angels. I really enjoyed reading about David Sylvester, the detective investigating the killings. I can picture him with his own spin-off mystery/crime series. Whenever the story shifted to Detective Sylvester, the book took on a dark, gritty quality, adding an interesting aspect to what is mostly an urban fantasy novel. The pay-for-protection system that enables those humans with the cash to spare to hire their very own Guardian Angels poses quite a thought-provoking ethical question. Is it right to only save the lives of those who can afford what is essentially a luxury service? Any Guardian who rescues a human without a protection policy is punished severely. This issue plays a pivotal role throughout the novel and leads to a few surprising revelations. Although Immortal City wasn’t a complete cure for my angel book blues, I loved how innovative the world was. It’s very easy to become absorbed in the details of the Angels’ glamorous lifestyles. This book is definitely worth a read if you’ve tried other angel books and are looking for a completely different take on them. All in All: While I didn’t really connect with either of the main characters, overall, Immortal City was an entertaining read. I certainly enjoyed it a lot more than some of the previous angel titles that I’ve read. Ohh I did want to read this book! But I have trouble with Angel books as well, I just don't seem to click with angels so I usually stare clear of them unless it's getting a fair amount of good reviews. BUT I do recommend reading Unearthly by Cynthia Hand! I loved it and I really thought I wouldn't. As far as this book goes, it sounds interesting yet I hate it when you can't connect with the characters. I loved the way you described them! That is exactly the way I think of characters sometimes but never know how to explain it. Unearthly is on my TBR list; I keep meaning to get it from the library. I'm happy to hear that it's so good! I had a hard time putting into words how I felt about Immortal City's Maddy and Jackson. I didn't dislike them, but they didn't wow me, either. That was my general feeling about the book, too. Awesome review, and I recommend for an angel book, Sweet Evil by Wendy Higgins. It is the best angel book I have read and one of the best book I have read this year. Maybe you're the daemon kind of girl, Lee. I liked Hush Hush and Unearthly, Halo started good but the last book, Heaven, was a joke! I think so, Braine! Lol. Another vote for Unearthly- I really want to read this now. I tried reading Halo a while back, but maybe 30 pages in, I realized that it wasn't my type of book.